On a sweltering August evening, much like any other, 19-year-old Aymen al-Jundi showed up at Baghdad’s al-Duleimi Hotel looking for anyone who might know Georges Malbrunot or Christian Chesnot. The two French journalists and their local driver, Mohammed al-Jundi, Aymen’s father, had just become the latest victims in a rash of kidnappings to plague Iraq’s steadily deteriorating security situation. It was August 23. Eighteen days earlier, a truce had broken down between American forces and the Mehdi Army (backers of the radical cleric Muktada al-Sadr, who has a strong base of support in the Shiite community) and fighting had renewed in Baghdad, Basra, Najaf and Nasiriyah. Najaf was under siege when al-Jundi, Malbrunot and Chesnot headed south on August 19 to cover the biggest story in Iraq at the time. They never made it. With increasing frequency, foreign journalists were being taken hostage in retaliation against American involvement in Iraq. Because of the symbolic importance of Najaf—one of the holiest cities in the Muslim world and the site of the Shrine of Imam Ali, the greatest of all Shiite saints, who is buried there and whom Shiite Muslims believe to be the true descendant of Mohammed—the number of abductions spiked during the siege of Najaf, the cessation of which was cited by kidnappers as a condition for releasing their captives. Ironically, the journalists most at risk were those covering the story from the Iraqis’ perspective—the very few western journalists who were not embedded with,or protected by, the U.S. military, along with their Iraqi translators and drivers. To make matters worse, the road to Najaf and the south passed through the towns of Mahmudiyah and Latifiyah, notorious insurgent strongholds. In August of last year alone, five journalists were kidnapped. Four were staying at the al-Duleimi Hotel. Filmmaker Andy Barends, who was staying next door to Chesnot and Malbrunot, said the silence from their room was palpable. Days before, friends had cleared out the second-floor room of James Brandon, a stringer for The Telegraph, after he was freed from his kidnapping ordeal on August 14. On August 13, American filmmaker Micah Garen and his driver, Amir Douchi, were abducted from the market in Nasiriyah, a southern Shiite town with a strong base of support for al-Sadr. The al-Duleimi, which rented out rooms with kitchens by the month, suited freelance journalists with limited funds working on long-term projects. Many of us took far greater risks than most staff journalists, whose safety nets (money, insurance, security details), usually a huge advantage, often included conditions and clauses restricting their travel. So when AFP, the French newswire service, ran a story insinuating that the hotel had some involvement in the disappearances, calling it “the eerie Duleimi,” few of us paid much attention, although the remaining French journalists moved out. The handful of freelancers who stayed became each other’s safety nets. At dawn on the 16th (three days before Chesnot, Malbrunot and al-Jundi were kidnapped), Phillip Robertson, a freelancer for Salon.com, and photojournalists Thorne Anderson and Kael Alford headed to Najaf. They were undeterred by having to take the most dangerous road in Iraq. Later that morning, I was in my room editing photographs for a story I was doing on the al-Rashad Psychiatric Hospital, when I heard that Micah Garen had been kidnapped. The report was vague and inaccurate. It stated that Micah was French—hardly unusual, as most Americans lied about their nationalities, preferring to affiliate themselves with non coalition countries. It was a lie that could save a person’s life. (Once, someone, who obviously hadn’t caught on to the ruse, asked me why there were so many “Canadian” journalists in Iraq.) I decided to let the American consulate know he was one of their citizens so they would intervene. The hotel manager and I rifled through Micah’s room for a photograph, and Andy and I, being the only journalists left at the al-Duleimi, put together a description for the Americans. Then we contacted James Longley, a documentary filmmaker with powerful connections in Nasiriyah, who was editing his latest footage up north in the relative safety of Kurdistan. We set in motion a tag team network of satellite calls and emails among Kurdistan, New York, Baghdad and Nasiriyah, as we worked towards securing Micah’s release. In the meantime, the news from Najaf continued to alarm. The Najaf police had raided several hotels, threatening journalists and ordering them to leave town. Kael had been fired on by snipers when she tried to get close to the city’s centre. She, Phillip and Thorne had gone to Najaf with the intention of covering the story from the point of view of the Medhi Army and gaining access to the Shrine of Imam Ali. As Phillip later described it, “The shrine was their Alamo—the front lines were measured in feet from it. It was the geometrical centre of the battle and the symbolic crux of the conflict.” But reaching the shrine had proven almost impossible and no Western journalists had made it there so far. First they would have to get through the American cordon surrounding the city and travel through a kilometres-long no-man’s land where heavy battles left behind a landscape of scorched buildings and rubble littered with ammunition shells and IEDs* (*improvised explosive devices, a jury-rigged bomb often camouflaged in street rubble or buried under melted asphalt). Even if they could find a way past the zone, they would still have to cross grids of sniper lines to reach the centre and the area controlled by the Medhi Army. Then, at noon on the 17th, Phillip called me from inside the shrine. Through close contacts in the Medhi Army, he and Thorne had found a way in. It was a major scoop. They were now broadcasting the story around the world from his satellite phone. The next day, Micah’s kidnappers threatened to execute him if the aggressions in Najaf were not ended within 48 hours. It was devastating news. Just the day before, one of James’s contacts had hinted at Micah’s release.“We have found the loose thread in the sweater,” he said. At the same time, the fighting in Najaf was, if anything, escalating. By then, I felt I had done everything I could to help Micah. Besides, I wanted to go to Najaf myself. I set out on the three-hour trip with Scott Baldauf from The Christian Science Monitor, our translator, Alaa Kamel, and our driver, Adnan. A few hours later I called Phillip. They felt perfectly safe inside the shrine, he said, but the fighting outside was getting heavier. The Americans were threatening a major offensive. Phillip and Thorne feared they would have to wait out an end to the fighting, which could be days or weeks away. This was a problem—and not only because there was some doubt as to whether they would get out alive. They might not make their Friday deadline to file the story. Soon other journalists were grabbing their bullet-proof vests and piling into their cars, until we had 20 vehicles following us down Medina Street towards the Old City. We drove through increasingly desolate, bombed-out stretches of road, at five kilometres per hour, white flags flying out the windows. Then, just as each vehicle, one by one, had joined us, one by one they were turning back, until we looked back and realized our number had dropped to eight. As we arrived at the edge of Medina, warning shots were fired at us and we came to an abrupt halt. The journalists behind us took cover in the nearby buildings. We hesitated. Then a Medhi Army fighter carrying an AK47 ran towards us, signalling for us to hold on. He was smiling. 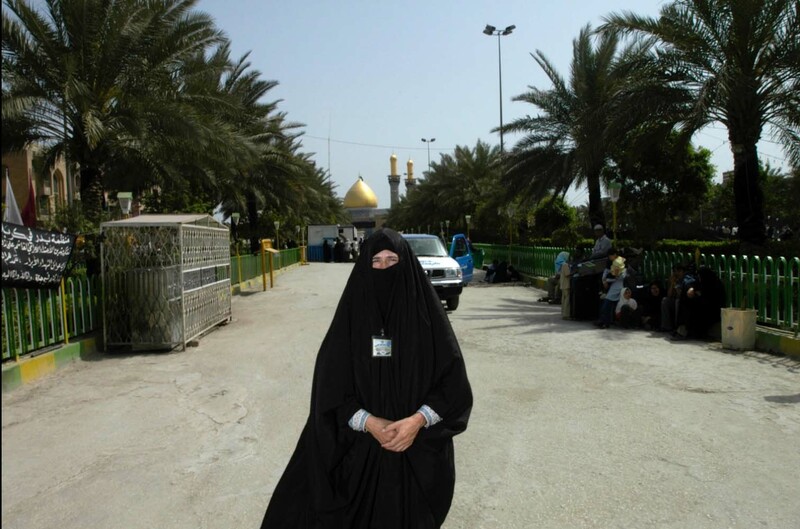 “Follow me on foot to the Shrine of Imam Ali,” he said. That evening we drove back to Baghdad along the same road on which, just hours earlier, unbeknown to us, Malbrunot, Chesnot and Mohammed al-Jundi had been abducted. The dangers of the road to Najaf were not lost on me. In April 2004, driving through Latifiyah on my way back to Baghdad, I had been captured by Sunni insurgents, who threatened to cut my throat for taking photographs of an American convoy they had attacked. I was lucky: they opted to confiscate my camera equipment rather than kill me. Every time I made the trip south after that, I would point out the house where the insurgents had held me captive, and the spot where I had photographed the burning trucks and the dead soldiers lying in the road. On August 22, while the siege of Najaf continued unabated, Micah and Amir were released. We read that Micah returned home to a hero’s welcome. A few days later, on August 28 at 11:20 pm, I got a distressed call from Aymen. He had just heard that Al Jazeera had broadcast footage they’d received of the kidnappers giving the French government 48 hours to revoke its controversial head scarf law— or the hostages would be executed. It was a Saturday and the French consulate told Aymen nothing could be done until Monday. Monday would be too late, he reasoned. We started calling and waking up anyone we thought could help. Journalists, ordinarily fiercely covetous of their sources, gave up long lists of names of high-level Sunni officials, anyone who might have influence or information. Not long after, we heard that there was a bounty on Aymen’s lifeand that his family had gone into hiding. From then on, we kept up with the story on the Internet, with no good news until the November day Mohammed al-Jundi was found alive, during the siege of Fallujah. Amidst the fighting and destruction of the city, it seemed like the one good thing to come out of the offensive. Malbrunot and Chesnot were not with al-Jundi; they would remain in captivity for over a month longer. On December 17, less than a month after Mohammed al-Jundi was re-united with his family in Paris, the French daily Le Parisien reported that he had been tortured by his American liberators. It sounded like a metaphor for the entire war. Back in the spring of 2003, Iraq was not such a dangerous place for journalists. Many Iraqis, relieved to be rid of Saddam Hussein, hoped to see an improvement. Even if they were not pro-American, they at least differentiated between the American government and American or foreign civilians and journalists. General mistreatment and disrespect of Iraqi civilians by American and coalition forces (which I witnessed many times) and the Abu Ghraib abuses changed that. It is hard to be optimistic about the situation in Iraq. It has become so dangerous to work there that even the most hardened war correspondents are refusing to go, leaving the story to newcomers trying to make a name for themselves. Embedding with the U.S. military is the safest option in these times. Embedded journalism provides a necessary view of the conflict (I myself was embedded for four months with a U.S. cavalry unit in 2003), but it is one-sided. Some journalists, including the ones mentioned in this article, take huge risks to make sure this does not happen. And yet surely we do it with increasing apprehension. For my part, I stayed home for the Iraq elections, opting to leave the story to someone else. The Siege of Najaf was the catalyst for Anderson, Alford, Ghaith-Abdul Ahad and myself to collaborate on a project that would show the civilian face of the War in Iraq, published the following year (2005) by Chelsea Green in the book Unembedded: Four Independent Photojournalists on the War in Iraq. For Shi’ite Muslims, the cemetery at najaf is the holiest resting place of all, the final earthly frontier. But with a murderous battle raging in the city center, even the gritty – and booming – business of burial is brutally interupted. For Shiite Muslims, the cemetery at Najaf is the holiest resting place of all, the final frontier of all final frontiers. “Millions are buried here – corpses upon corpses, generations upon generations,” said gravedigger Rahim Naji, “people from all over the world – Shiite, Sunni, Christian, even Jewish. Death is our business, and Najaf never turns away the dead.” The cemetery lies just north of the shrine, spanning over five kilometers outward in a great semi-circle. “Najaf is like a port for the dead,” Rahim told me. At dusk the American bombardments intensify: the sound of fighter planes came first, followed by tiny black specs trailing white smoke. You can’t hear the sound of explosion when standing upwind where we were, but moments later huge billows of grey-black smoke rise in the distance over the cemetery from strike points near the Shrine. The gravediggers were forced out of their offices in the middle of the battle, off to the far end of the graveyard, known as the New Graveyard. Yet even there, tombs were destroyed by mortars and bombs. Seventy-year-old Auda Misher Hamad had left Basra at 7 a.m. for the five hour trip to Najaf, carrying the body of his sister-in-law on the roof of his Sedan. “It’s very difficult in this heat,” he complained. The temperatures hovered above 45 degrees Celsius. “We performed burial rites and prayers at home, and then kept her body in an air-conditioned room overnight.” Road travel was complicated with checkpoints slowing movement and forcing detours. “I needed petrol, but the lines for gas were so long I was worried about the body decomposing. Thank God the other vehicles let us go ahead of them.” One family bringing in a dead relative told us they were shot at by Iraqi police on the road between Karbala and Najaf. Traditionally, bodies arriving in Najaf are meant to be taken to the Holy Shrine of Ali for prayers before being brought to the gravediggers. But under the circumstances, the gravediggers — who are university educated, and often have clerical training — were performing all the rites. As we approached the gravesite in the soaring noon heat, the putrid odor of rotting corpses was stultifying. One gravedigger walked among the others distributing spritzes of perfume. They were busily digging, while the sometimes nameless martyrs were brought in, each having been prepared according to Islamic canon law, the Shariah law. This means first washing the corpse, and removing all jewelry, if there is any; and wrapping the body in a clean, white sheet of cloth. The grave is not deep enough until the gravedigger can stand in it chest high. This is to prevent odor from rising from the grave and attracting animals. At the base of the deep, narrow grave, the digger builds a body-length extension long enough to place the corpse horizontally. The corpse is slid into the hole feet first, then the gravedigger maneuvers the body into the extension, laying it carefully on its right side, with its face pointed toward Mecca. Once the body is in place, bricks are handed down into the grave to seal up the hole. A moment later, the gravedigger climbs out of the hole, and a young apprentice fills in the hole with sand. The gravediggers all gather round and a little pile of sand is built up on top of the grave, the identification water bottle stuck in. Burning incense is placed around the sand, and the prayer rites are given. When I’d first met the gravedigger Rahim a week before, he had held out his fists with a pile of sand in each to show me: “See this? This is the sand of the Holy Land. Everyone wants to be buried here.” A week later, I watched as the rites were read over the corpse of an unidentified fighter: “Allah Akbar (God is great), Allah, the person lying before you is your creation. If he was a sinner, please forgive him; if he was good, please bless him.” A moment of silence, and they moved on to the next plot. Karbala, Iraq, March 2004. Photograph of Rita Leistner by Ali, who a month later would save her life after she was captured by Fedayeen insurgents.